The SITR is an annual publication series intended to bring together insights from analysis of landscape-management case studies from the collection of over 80 studies collected under the International Partnership for the Satoyama Initiative (IPSI). These case studies are all in some way related to the basic concept of the Satoyama Initiative and are searchable and contain a wealth of information, but due to the sheer volume of data it could be difficult for someone to find lessons relevant to their own work without already knowing in advance exactly what they were looking for. For this reason, a number of these cases are collected under the theme of each year’s volume, along with a synthesis chapter summarizing important findings and lessons learned. The theme of this year’s volume is “mainstreaming concepts and approaches of socio-ecological production landscapes and seascapes into policy and decision-making” (jump to the full document >>). Readers of the Cultural Landscapes Blog may be most interested in the two cases from Europe: “Heritage wheat renaissance in Montespertoli, Tuscany” by Guido Gualandi and Rebecca Narcisa Gualandi; and “Governance-mix for resilient socio-ecological production landscapes in Austria – an example of the terraced riverine landscape Wachau” by Pia Kieninger, Katharina Gugerell and Marianne Penker. Other cases from Africa and Asia should also provide useful supplemental reading. To briefly summarize findings from the synthesis chapter, SITR volume 2 identifies several challenges, success factors and principles for mainstreaming as listed below. • Institutional mismatches and inadequate coordination between institutions and organizations at different levels (e.g., between local and regional) or within the same level of operation (e.g., between upstream and downstream actors in a watershed). • Vertical and horizontal power dynamics leading to hierarchies, elite capture of benefits, unequal access to resources and related asymmetries. • Perverse incentives such as subsidies that promote unsustainable practices (e.g., excessive use of chemicals in farming). • Financial and economic pressures including lack of availability and access to funding for desirable activities. • Multi-stakeholder involvement and a participatory and inclusive approach. • Open learning and dialogue between different knowledge systems to ensure that appropriate technological innovations are integrated into conventional and traditional SEPLS-management practices. • Leveraging existing knowledge on resource use and management in order to foster endogenous development and minimise external-expert-driven management. • Diverse production activities based on the needs of local community that mitigate risks from market perturbations. • Shared vision, commitment and cooperation of stakeholders, with composite goals reflecting multiple functions of SEPLS and stakeholders’ interests. • Communication to consumers and other external users, and education about SEPLS values. - Institutional flexibility, stability, networking and clear definition of roles. • Funding with strategic planning and free, prior and informed consent to ensure that management activities are implemented with the active involvement of all stakeholders beyond the funding period. - Joint implementation and monitoring of management interventions. 1. Mobilise knowledge toward action. This includes integrating traditional and modern scientific knowledge of SEPLS in order to find appropriate solutions for the social, political and economic context, and translating, transcribing and transforming knowledge through inter- and trans-disciplinary approaches. 2. Foster and leverage inclusive participation. This includes fostering a participatory approach to create a shared vision and identify composite or inter-linked goals that address multiple objectives, fostering “collective efficacy”, building trust among stakeholders, identifying relevant institutions and define roles, engaging higher political systems and getting feedback, and encouraging cross-learning among communities and other stakeholders for development of capacities and to raise awareness. 3. Adaptive planning and management of activities. This involves establishing long-term monitoring and periodic review, and making sure replication efforts are flexible. Each of these concepts is explored in greater depth in the publication. Much more information on the findings, the case-study collection and analysis process, plus the case studies themselves can be found in the inside and on the IPSI website. Anyone involved in landscape approaches is encouraged to look at it. The third volume of the SITR, with a theme related to improving livelihoods through an integrated landscape approach, is now under development, and readers can expect it toward the end of this year. The above mentioned second volume of the “Satoyama Initiative Thematic Review” has been published and is now available for download. 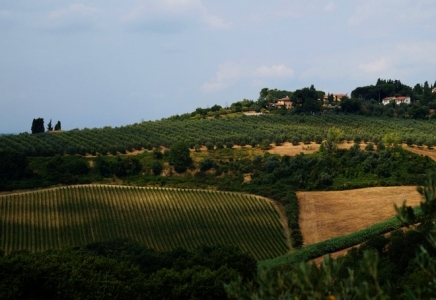 Photo: The Gualandi farm, where “the best wine in Tuscany is produced”, according to the owner (credit: G. Gualandi).